The bananas we eat today aren't your parents' bananas: We eat a recognizable, consistent breakfast fruit that was standardized in the 1960s from dozens into one basic banana. But because of that, the banana we love is dangerously susceptible to a pathogen that might wipe them out. That's the story of our food today: Modern science has brought us produce in perpetual abundance-once-rare fruits are seemingly never out of season, and we breed and clone the hardiest, best-tasting varieties of the crops we rely on most. As a result, a smaller proportion of people on earth go hungry today than at any other moment in the last thousand years, and the streamlining of our food supply guarantees that the food we buy, from bananas to coffee to wheat, tastes the same every single time. Our corporate food system has nearly perfected the process of turning sunlight, water and nutrients into food. But our crops themselves remain susceptible to the nature's fury. And nature always wins. 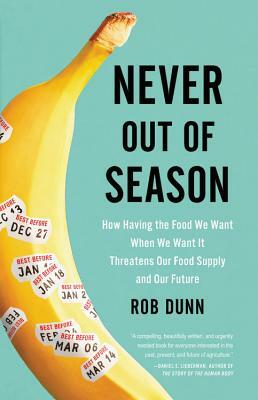 Authoritative, urgent, and filled with fascinating heroes and villains from around the world, Never Out of Season is the story of the crops we depend on most and the scientists racing to preserve the diversity of life, in order to save our food supply, and us. Rob Dunn is a professor in the Department of Applied Ecology at North Carolina State University and in the Natural History Museum of Denmark at the University of Copenhagen. He is the author of The Man Who Touched His Own Heart, The Wild Life of Our Bodies, and Every Living Thing, and his magazine work is published widely, including in National Geographic, Natural History, New Scientist, Scientific American, and Smithsonian. He has a PhD from the University of Connecticut and was a Fulbright Fellow. He lives in Raleigh, North Carolina.